While detailing the association of senior Saudi diplomats with Islamic radicals, the 28 previously redacted pages of the 9/11 Commission report do not offer significant evidence of official Saudi support for Al-Qaeda. 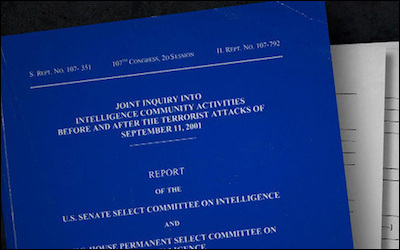 On July 15, the U.S. Congress released the appendix, redacted since 2002, to the governmental inquiry regarding American intelligence failures in the period leading to the terrorist attacks of September 11, 2001. The "28 pages" kept out of the public eye for 14 years have stimulated widespread speculation. One thing, however, came to be accepted widely: that the 28 pages had to do with the involvement of Saudi Arabian subjects or officials in the terrorist atrocities. Now that the controversial section of the 9/11 report is available for scrutiny, the suspicion that it dealt with Saudis is confirmed. But the 28 pages do not offer significant evidence of official Saudi support or approval for Al-Qaeda or the 9/11 conspiracy. Rather, the 28 pages, headed as Part Four of the report, the "Finding, Discussion, and Narrative Regarding Certain Sensitive National Security Matters," recapitulate matters mainly reported publicly soon after 9/11. The 28 pages mostly recapitulate matters publicly reported soon after 9/11. The 28 pages admit that U.S. intelligence agencies failed to assess adequately the relationship of Saudi Arabia to radical Islam, because of the kingdom's status as an American "ally" [qualifying quote marks appear in the text of the Report]. That link was, however, known throughout the Muslim world. A review of information that had been collected by the Federal Bureau of Investigation and the Central Intelligence Agency dredged up a range of names of Saudis connected both to the country's rulers and diplomats and to participants in the 9/11 plot. The most information concerned Omar Al-Bayoumi, who according to the Report was believed by Muslim informants to be an agent of Saudi intelligence. Al-Bayoumi met in San Diego with two of the 9/11 hijackers, of whom 15 of 19 were Saudis. The two individuals were Khalid Al-Mihdhar and Nawaf Al-Hazmi. Al-Bayoumi received financial aid from Saudi sources, and the money he was paid went up when he contacted Al-Mihdhar and Al-Hazmi. From left to right: Omar Al-Bayoumi, Khalid Al-Mihdhar, and Nawaf Al-Hazmi. Al-Bayoumi additionally had reputed contacts with the Holy Land Foundation (HLF), a fundraising front for the Palestinian extremist group Hamas. Leading HLF officers were convicted in 2008 of conspiracy to provide material support to a terrorist organization and related charges. Al-Bayoumi is described in the report as "providing guidance to young Muslims [through] writings [that] can be interpreted as jihadist." A second Saudi figure described in the 28 pages is Osama Bassnan. According to the Report, Bassnan was an associate of Al-Bayoumi and "may have been in contact" with Al-Mihdhar and Al-Hazmi. Once again, Muslim informants suggested to American officials that Bassnan was a Saudi intelligence agent. Bassnan was said to be considered an Islamic "extremist" and adherent of Bin Laden. The 28 pages appear most significant when they discuss relations between Princess Haifa Bint Sultan, the wife of then-Saudi ambassador to the U.S. Prince Bandar Bin Sultan, Al-Bayoumi, and Bassnan. The wife of Bassnan received $2,000 per month from Princess Haifa. The money was transferred in payment for "nursing services," but no such work was performed, according to the Report. Bassnan's wife was sent more funds, and Prince Bandar disbursed $15,000 to Bassnan. Several more Saudi names appear in the 28 pages. A Muslim cleric known as "Shaykh Al-Thumairy," from Culver City, Cal., may have been in contact with Al-Mihdhar and Al-Hazmi. Saleh Al-Hussayen, reportedly a Saudi Interior Ministry official, stayed at the same hotel in Herndon, Va., when Al-Hazmi was there. Al-Hussayen denied knowing the hijacker but was considered "deceptive" when questioned the FBI. He left the U.S. for Saudi Arabia before the FBI could conduct a follow-up interview. Abdullah Bin Laden, the half-brother of Osama Bin Laden, was employed by Saudi-backed agencies in the Washington, DC, area. He was said to be a "close associate" of two more 9/11 hijackers, Muhammad Atta and Marwan Al-Shehi. Other data in the 28 pages reveal that telephone numbers in the U.S. were found in the personal directory of Abu Zubaida, a high Al-Qaeda leader, including that of Prince Bandar's residence in Aspen, Colo., run as a corporate entity titled "ASPCOL." In addition, the 28 pages comprise clues and reports about other Saudi-backed Islamic charities and Saudi individuals. Saudi authorities are criticized for their reluctance to assist the U.S. investigation, including a refusal to admit that 9/11 hijackers identified by their passports were present in Saudi records. To emphasize, very little of this could be reasonably described as new or even as sensitive. The web tying Prince Bandar and Princess Haifa to Al-Mihdhar and Al-Hazmi was described in detail in reportage in 2002. An explanation of the case is simple enough, but does not prove that the Saudi royal family supported Al-Qaeda knowingly or directly. Wahhabism remains the sole Islamic interpretation permitted in Saudi Arabia. The association of high Saudi diplomats with Islamic radicals, however tenuous, reflects the nature of fundamentalist Saudi Wahhabism, the sole Islamic interpretation permitted in the kingdom, which is the ideological backbone of Saudi rule and, at the same time, inspires frenzied fanatics in all the world's Muslim countries and Muslim minority communities. Some, like the so-called "Islamic State" (ISIS) fight against the Saudi state. Saudi Arabia cannot be impeached as an official backer of Al-Qaeda. This is no surprise. But until Saudi Wahhabism is removed from its position of control and indoctrination of the country's Muslims, the kingdom will produce terrorists. That was known in 2002 when the 9/11 Commission delivered its Report, and it is known to Muslims everywhere today. The 28 pages have merely dramatized the need for Muslims to rid themselves of Wahhabi and other radical influences.